A great relic, also known as the Cord of the Eye. Every infant Great One has this precursor to the umbilical cord. Use to gain Insight and, so they say, eyes on the inside, although no one remembers what that truly entails. 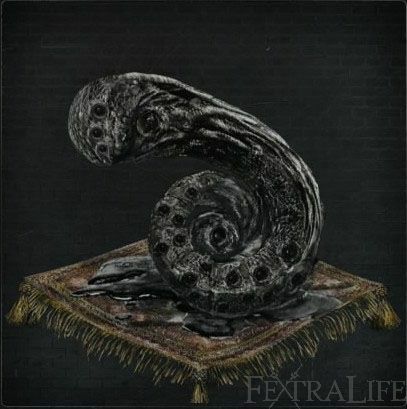 Third Umbilical Cord is a Consumable Item in Bloodborne. Mergo's Cord: "Every Great One loses its child, and then yearns for a surrogate. This Cord granted Mensis audience with Mergo, but resulted in the stillbirth of their brains." Workshop's Cord: "Every Great One loses its child, and then yearns for a surrogate. The Third Umbilical Cord precipitated the encounter with the pale moon, which beckoned the hunters and conceived the hunter's dream." Arianna's Cord: "Every Great One loses its child, and then yearns for a surrogate, and Oedon, the formless Great One, is no different. To think, it was corrupted blood that began this eldritch liaison." Iosefka's Cord: "Provost Willem sought the Cord in order to elevate his being and thoughts to those of a Great One, by lining his brain with eyes. The only choice, he knew, if man were to ever match Their greatness." Can be used to access the third ending in the game, consuming 3 Cords before the fight against Gehrman, The First Hunter or at least before he dies, and unlock the fight against Moon Presence. Increases your Insight by 3 when consumed. 1. After killing Mergo's Wet Nurse. 2. Can be found in the Abandoned Old Workshop. Arianna will only appear in Oedon Chapel if the player sends her there. If the player does not interact with Arianna, her shoes can be found dropped from an enemy in Iosefka's Clinic at night time. This suggests that she found her way to the clinic on her own. If you visit Iosefka's clinic from the backdoor before fighting Rom, the Vacuous Spider she will turn hostile if you go too far up the stairs. If you kill her at this stage you cannot get her Umbilical Cord, however you can run away from the fight and still get it upon your return after fighting Rom. In the US versions of the game it is called "One Third of Umbilical Cord". In the UK versions it is called a "Third Umbilical Cord". There is a note in the second floor of the Lecture building stating simply "Three third cords" being the sole allusion to how to unlock the secret ending. Named 3本目のへその緒 in the Japanese version, literally meaning "Third Umbilical Cord". Named "Terzo Cordone Ombelicale" in Italian version, literally meaning "Third Umbelical Cord"
In the original 1.0 version of the game as well as the original printing of the future press guide the description of the abandoned workshop umbilical cord says "One of the heirlooms used to contact the Great Ones, originating in the child of the Vilebloods. Long ago, in an encounter with the Great Ones, a contract was established, establishing the hunters and the hunters dream" . Another small addition is that each cord has " Keep one to fend off foul spirits, or use it to obtain great Insight". How can you tell how many umbilical cords you&apos;ve eaten thus far? I doubt it&apos;s the "true ending". If something like this even exists. The special unique secret ending in DS3 is the Dark Lord ending (Londor wins!). The formula "hard to obtain means true ending" doesn&apos;t work in the Soulsborne series. That massive spoiler warning should be a bit more... massive. I didn&apos;t even notice it until after the fact. Phony Iosefka is still hostile after fighting Rom. Blood moon makes her not-hostile, I think. Just wanna be specific for accuracy&apos;s sake. As a lore note, getting &apos;eyes on the inside&apos; may be interpreted as being able to achieve lucidity or &apos;control&apos; over one&apos;s dreams. In lucid dreams, you are able to interact with the dreamworld as if it were real life. It would be like living in your own fantasy, shaped by your own imagination. U can even bring and communicate with real life people in your dream. Obviously one can only dream when one is sleeping (or more importantly, when one&apos;s outer eyes are closed). So i think that the game defines &apos;dreaming&apos; as observing pictures INSIDE the brain with eyes on the INSIDE. Great Ones may have a powerful version of this ability which allows them not only to observe different planes, but also create new dimensions by just &apos;dreaming&apos; about them - perhaps Mensis for the Nightmare of Mensis, Kos for Hunter&apos;s Nightmare, and (speculation) Moon Presence for Hunter&apos;s Dream and Yharnam. Perhaps their ability to induce lucidity in dreams is so powerful that they can actually transfer the conscious of people in the waking world to their dreams. People with lesser minds would not be able to tell the difference. People with higher insight may realize that what they they see is actually what they are being made to see (cite Rom, noted as hiding &apos;all sorts of secrets&apos;. On a separate line, the description of Blacksky Eye hints that some form of the cosmos exists and can be accessed from inside the eye. While an eye cannot see unto itself, an eye on the &apos;inside&apos; could actually communicate with the cosmos (and by extension, the Great Ones). But perhaps this requires the blessing or aid of a phantasm, creatures known to act as a conduit to the Cosmos. Or perhaps &apos;using&apos; third umbilical cords provides this &apos;in-sight&apos;, which may explain how Laurence and Gehrman may have contacted Moon Presence (possibly in the abandoned workshop?). But we know third cords are exceedingly rare, found only when a woman is impregnated by a child of the Great Ones - an event known to occur only during Blood Moons. The major problem, however, is that School of Mensis used hexagonal cages on thier heads to somehow telephone the Great Ones. This doesn&apos;t seem to require eyes at all and is more related to brains. So I&apos;ve no idea what that&apos;s about. So one cord came from Mergo, the second from Arianna’s child, a third is found on (or in?) Imposter Iosefka as if she was in the final stages of pregnancy, and the last is found without an owner in the Abandoned Workshop. I wonder if this one was collected from the Orphan of Kos, considering it doesn’t drop an umbilical, and Gehrman and the hunters obviously have a deep connection to the Orphan? I guess this is what drew the attention of the “pale moon,” perhaps indirectly, which could explain the “curse of blood” laid upon the hunters by the residents of the Fishing Hamlet. Perhaps the Moon Presence is the very curse itself, along with the bloodlust it represents. "In the UK versions of the game it is called "One Third of Umbilical Cord". In the US versions it is called a "Third Umbilical Cord."" I think these gotta be switched, dude or someone I don&apos;t really know who to talk to about this. US and UK version are the same and have always said One third of Umbilical Cord. Strangely, as of this posting, the Canadian version of the game (having French printed on the back cover) still lists the item as "One Third of Umbilical Cord." Not sure if it&apos;s a regional thing, or even why the Canada/US versions would be any different or patched differently, but yeah it&apos;s still got the old(?) name for it. I&apos;m guessing the name is hinting that it isn&apos;t "one third of" an umbilical, but that it&apos;s "a third umbilical," probably related to the concept of the third eye. The optic nerves could be thought of as a sort of umbilical, connecting our eyes to our brain, so perhaps a "third umbilical" would allow us to attach more eyes. Still, the shells of the Snail Women look remarkably similar to the fossils of a prehistoric gastropod called "Kosmoceros," albeit much, much larger, which is pretty neat. Silly question but for the sake of argument, Say I consume the cords as soon as I got them, would I still get the secret ending? You can get the cord from the Abandoned Workshop at any time but the rest can only been obtained after killing Rom. What do I do if I kill the one in the clinic too early and I get the one in the chapel killed by the beast? This sounds dumb but whatever, im seriously asking this question:Has anyone tried eating all 4 cords? Does it kill you? Do you get the same (best) ending as eating only 3? I sent Arianna to the Oedon Chapel and something killed here there during purple sky phase, so no cord from her. If you really want third part of the cord you better send her to the clinic and try to avoid Iosefka before purple sky(before killing Rom). Looks like the easiest and best way to do it. Also has anyone checked, will she survive in chapel if send only her there and rest of NPS into the clinic? the item is called "third umbilical cord" not "one third umbilical cord"
Don&apos;t know if this is helpful but I started the fight with Gehrman before using the 3 cords, lost to him, then went and got them and used them and beat Gehrman and still got the secret boss to spawn. Apparently as long as you&apos;ve done it before you beat him, it&apos;s ok.
On this wiki&apos;s article for NG+, it says that you should make sure to collect them all before starting a NG+. Does anyone know what they mean by this? Do they not respawn in a second/third/etc. playthrough? Just to clarify, topic really. So long as I &apos;consume&apos; them before the final boss with gherman I get a secret boss?With as few spoilers as possible, can someone give me specifics? Is it a good ending, a bad one...? If I read ahead I&apos;ll probably not even bother finishing the game. dose Iosefka drop the cord even if Arianna is not their. i waited to long and Arianna is no longer around. did i F up?